At times in our professional careers – and in our personal lives – we may be called upon to craft an obituary for a professional acquaintance, colleague, friend or loved one. As a communications consulting firm, we have worked with hospice clients in developing appropriate guidelines for such sensitive messages. In addition, we occasionally are asked to put together such tributes on behalf of a company executive, board member or respected volunteer who has passed. It can be a daunting challenge – where to start? Contemplating one simple question can serve as a practical starting point: How would you like to be remembered? At its most fundamental level, an obituary serves several functions. It’s a notification that someone has passed. It’s an account of the life they’ve lived, as well as the range of people whose lives they’ve touched – not only extended family but special friends, acquaintances and others. It also provides important news and directions for planned services or funeral arrangements. Sometimes it can contain special thanks to caregivers or friends who were there in a time of need. It might also be an opportunity to suggest where charitable donations can be given in a loved one’s memory. Still, at its best, an obituary is a tribute to a life well-lived and a person well-loved. Remember that you’re not just reporting information. You’re telling the story of someone’s life. Of course to do that, you’ll need to gather basic information. By talking with loved ones you should be able to get the basics: age, occupation, education, military service, where they were born, places they lived. Try to get an appreciation of their lives by looking through different lenses. What were their interests? What sports or hobbies did they enjoy? What about community involvement or faith-based activity? What charity events did they promote or support? What were their most important or impressive accomplishments? Instead of a formal interview, you may find that family members or friends will respond better in more relaxed conversations. Give them time to think and reminisce in an informal, comfortable setting. Get them to tell interesting stories about their interactions with the loved one who has passed. The goal is to give readers insights into what made that person special. Maybe it’s a special trait of character like a short fuse or a sense of humor that brings a smile to a loved ones’ face. Maybe they’ll talk about the individual’s sense of modesty, community-mindedness, generosity, love of travel and so on. With those memories as your palette, try to paint a word picture of who this person was and what they meant to the world, their friends and their loved ones. Don’t just say that so-and-so was a good person. Show the reader by describing their interactions and the energy they put into those aspects of their lives they held most important. As you round out the obituary, you’ll need to determine which family members to include – those who preceded them in death, as well as surviving relatives and other loved ones. How far back does the family want to go? Be extra careful about accidentally omitting people: grandparents (both sides, living as well as deceased), step-families, aunts and uncles, significant others, and of course, children, grandchildren and more, if needed. Remember that those who are giving you information for the obituary have lots of other things on their mind. Be extra careful not to hurt anyone’s feelings with an unintended omission. Finally, find out if there is a specific charity or other cause the family wants to single out for memorial donations. 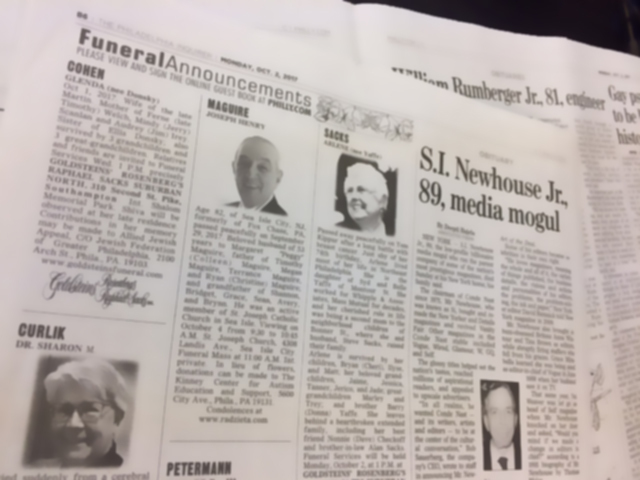 Consider creating several different versions/lengths for the obituary – a short one for a paid ad, and a longer one that could be used as a handout at the eulogy or funeral service. Check with your local newspaper for appropriate publishing lengths. With genealogy so popular, you might consider an even longer one to offer some family history, or to post on a website. Also, make sure to proofread the finished work. Better yet, have a family member or other knowledgeable person review the finished copy for accuracy and completeness. Finally, keep in mind that, unfortunately, there are unscrupulous people in this world who look to prey on the vulnerable. Be careful about including information that might be used for identity theft, or that might make someone vulnerable for exploitation. Depending where you live, you may want to avoid identifying the address of the surviving spouse, or even the time of the funeral, as would-be burglars sometimes scan obituaries so they can target what they think will be an unwatched house. The bottom line: be compassionate, be complete, but also be careful. » Next post: What’s Scarier than Being Unknown?